Crispy Chicken Tenders marinaded in buttermilk then fried (or oven baked!) golden brown are juicy and flavorful with southern seasonings. We love recreating fun family favorite American restaurant meals at home and these tenders are great served with Cole Slaw, Baked Beans my famous Baked Mac and Cheese and Macaroni Salad. I literally cracked a secret code in making chicken tenders crispy, juicy and flavorful. 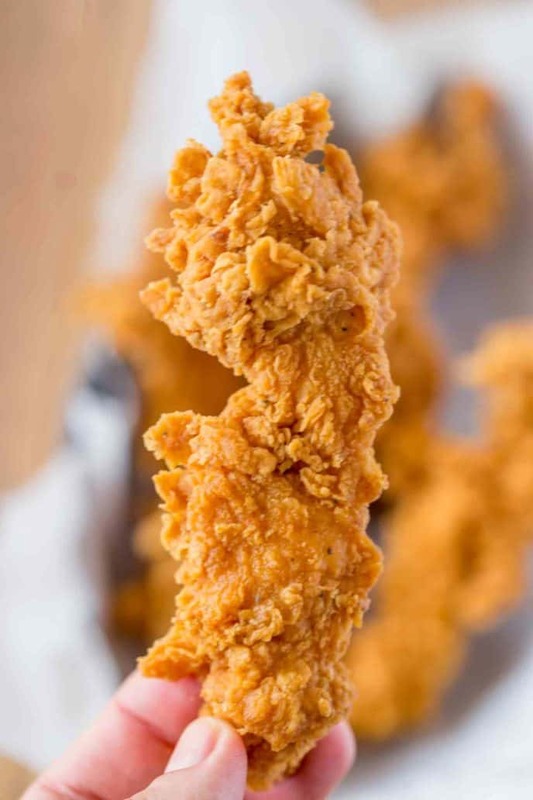 These Homemade Chicken Tenders are soaked in buttermilk and fried crisp are super flavorful, moist and extra crispy on the outside. Plus with spices like the kinds you’d get at KFC they are perfect for replacing fast food cravings and even game day parties. Plus I have directions for an oven baked version too, so there can be no feeling guilty about indulging in this awesome chicken fingers recipe. The addition of the KFC spices that I use in my potato wedges recipe takes these chicken fingers over the top. 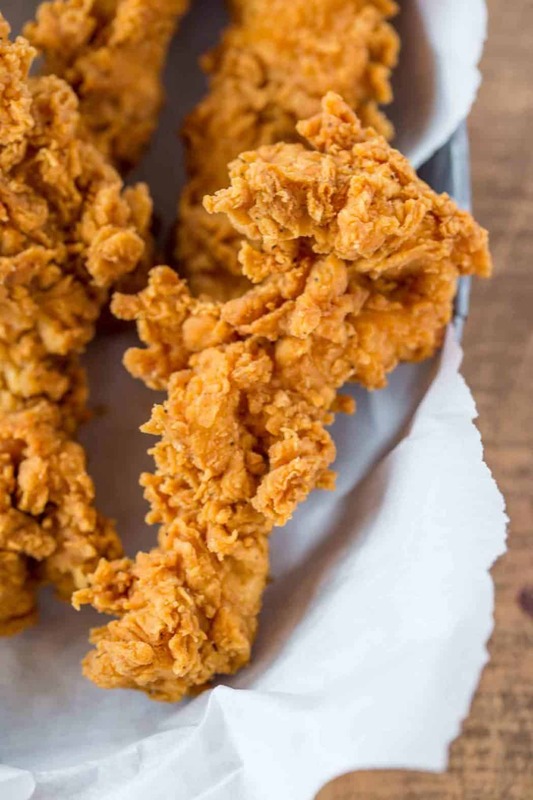 KFC always said their chicken was finger licking good, you will want to because this chicken, like my Ultimate Fried Chicken Recipe (oooh, or my Oven Fried Chicken) is that good. 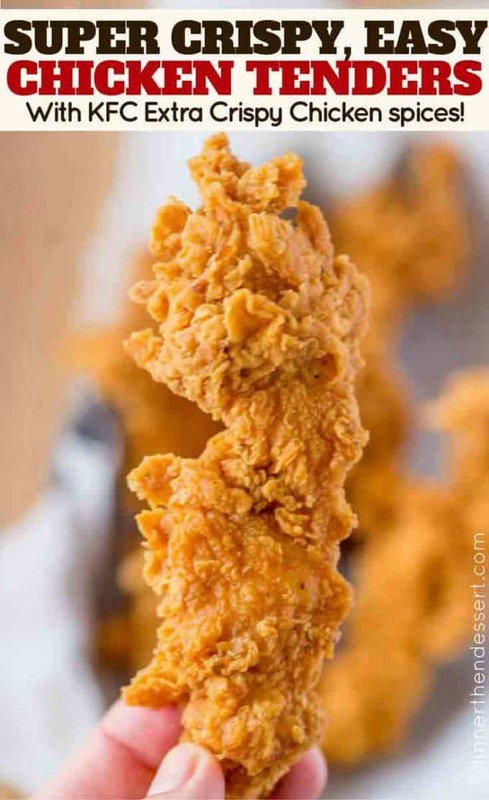 They’re golden brown fried chicken tenders made with either chicken breasts (make sure you use skinless chicken breasts) that you can slice into thinner chicken strips or you can use chicken tenderloin pieces and skip an extra step in the preparation. If you’re using a chicken breast you will cut it along it’s long side to make chicken strips the right length for these chicken tenders. 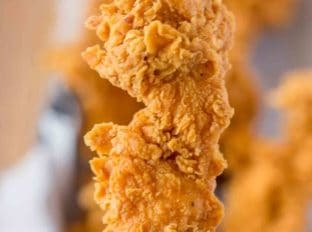 If you cut the chicken strips the shorter way they’ll be about 2-3 inches long and be closer to the size of an average fish stick. Want some different seasoning ideas for next time? Italian Chicken Tenders: Swap out the paprika for grated parmesan cheese and 1/2 teaspoon of dried Italian seasoning. Serve with a squeeze of lemon juice. Cajun Chicken Tenders: Add 1/2 teaspoon cajun seasoning and double the garlic powder. Once fried you can keep the chicken tenders crispy on a baking sheet or a cookie sheet in a low oven at 250 degrees while you finish frying the remaining chicken tenders or keep them warm until your even starts. The low temperature will ensure the chicken fingers stay juicy too, it isn’t hot enough to dry them out unless you leave them in there for hours. Do not cover the chicken though as it will create steam which will ruin the texture of the crispy chicken. 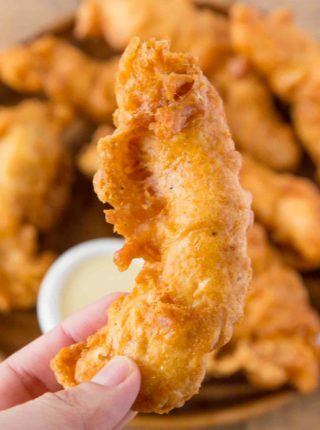 With the big game coming up we are looking for fun finger foods and chicken tenders are the perfect finger food. If you’re looking for more game day food look no further! Philly Cheesesteak Sloppy Joes <— these are ridiculously good. The buttermilk acts as a tenderizer which makes the chicken juicy. Even just a half an hour soak will help with flavor and it also acts as a binding agent for the first coat of seasoned flour. Even if the chicken tenders are going to be oven baked they should still be marinaded in buttermilk before baking. If you would like to use panko breadcrumbs or regular breadcrumbs in this recipe to add more of a texture or crunch, like in a tempura recipe, you will have to reduce the flour to make up for the additional coating. 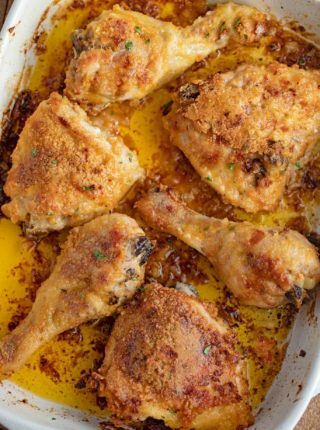 Using breadcrumbs also allows you to bake this recipe instead of frying it (see baked chicken tenders recipe below). After the buttermilk marinade add the spices to panko crumbs or breadcrumbs instead of flour. Dredge the chicken from the buttermilk into the breadcrumbs then add to a baking sheet coated with cooking spray. Brush with just 2 tablespoons of melted butter or spray with cooking spray (melted butter will give better flavor). Looking for some more fun fried chicken and sides? Accent Seasoning: The x factor in the original KFC copycat recipe (use 1/2 teaspoon) (this is MSG, so use at your discretion). 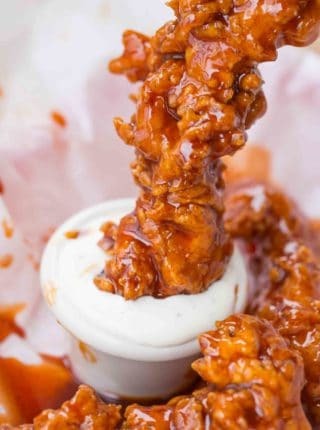 Cut the chicken breasts into four tenders each and soak them in a bowl with the buttermilk and hot sauce for 30 minutes. Add the eggs to one bowl and the flour and spices to a second bowl. Dip each piece of chicken from the buttermilk bowl to the flour mixture. Dip it into the eggs then back into the flour mixture. Shake excess flour gently off and put the chicken onto a baking sheet. Repeat with all the pieces. Heat the oil (three inches deep) in a dutch oven on medium high heat to 350 degrees. Fry the chicken in small batches for 5-7 minutes or until golden brown. Can this be made in my air fryer?? I haven’t tested it but if you decide to try, I’d love to know how it turns out. Thanks! Did you try it in the air fryer? Cause I was just thinking the same thing! I have always done all the cooking at home. I made these tonight and my wife said I had overdone myself this time. She vowed to never eat chicken tenders from any where else again other than mine. Just tried this recipe for the first time last night. It was AMAZING!!!! WE used 64 oz of oil in a dutch oven and it was the perfect amount of oil. At 350 degrees they cooked very quickly 3-4 minutes but the cutlets were super thin. This is a winner and we’ll be making again! So glad you enjoyed it, Sal! Thanks for the 5 stars! Hi there! 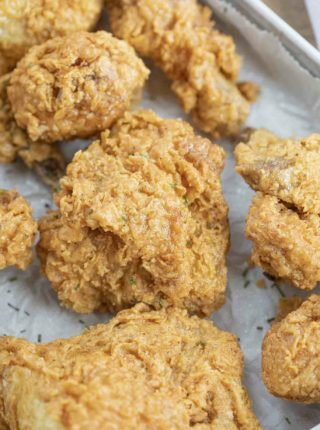 Would you recommend making popcorn chicken and fried wings with this recipe? Hmm, popcorn chicken would probably work but breading such small pieces might be a challenge. As far as fried wings go I think because the meat is hidden in between the bone, it won’t be cooked before the outside gets to dark. I’m not sure it would work. Sorry. I found the addition of dipping in egg and the inclusion of baking powder in the flour made the coating more bread than crust and separated from the meat…I would keep the baking powder but skip the eggs…if crunchier coating desired just double dip between buttermilk & flour. Yes, I would recommend freezing them after they’ve been made. Flash freeze them completely in a single layer and then store them in a freezer safe ziplock bag. To reheat, place in the oven at 375 degrees 20-30 minutes. Hope this helps! Hello, may i know, what flour do you use ? I used all purpose flour for this recipe. I hope you enjoy them! Can I use pablo bread crumbs as well as flour? Tuen out the same? I would suggest making them in the oven if you’re adding a bread crumb coating. Enjoy! Were these really spicy on 1-10 scale! Or should I leave hot sauce out! They look really good just was wanting to know spicy factor! They’re not spicy so you should be fine! If we were to decide to add the accent seasoning do we replace the salt with it or add that on top of the salt the recipe already calls for?? You’ll want to omit the salt if you’re using the accent seasoning. Can i not use hot sauce with the buttermilk i do not like spicy. Haha, nothing wrong with frying on the fourth!! I’m so glad you guys enjoyed it! Thanks for coming back to let me know! Could I make these using a Skillet to cook them in? Yes, you’ll just want to make sure that it’s deep enough to be able to fry the chicken. I like using a dutch oven because the sides are high which means less splattering and clean up. Wow!! The fingers were heavenly! This recipe is my families new favourite!! Hello! How much of the accent seasoning is needed for this recipe? This recipe doesn’t require the accent seasoning. The original KFC recipe does and I wanted to include it in case others were interested in it. Where’s the Accent used?? I’m missing it. I didn’t use it for my recipe because it’s MSG. I just wanted to give the information if others wanted to use it. 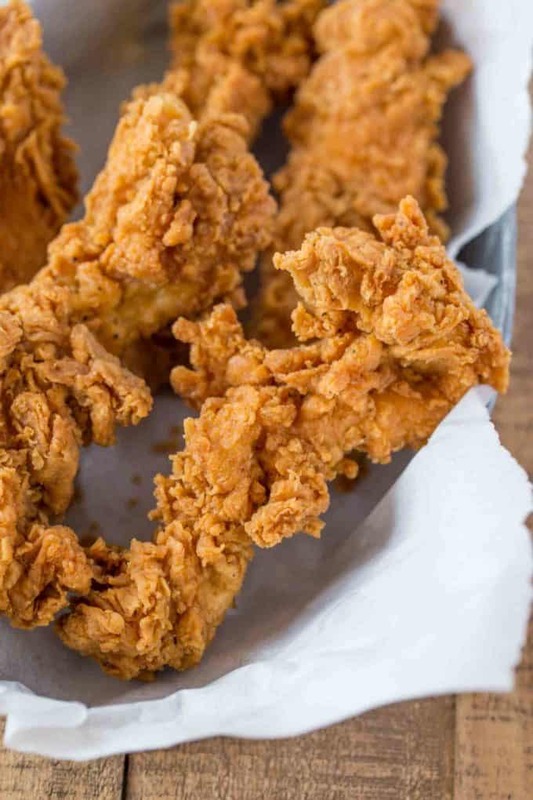 I’m always on the lookout for a great fried chicken tenders recipe and these look perfect! Made these today with some mac-n-cheese, so good! Thanks for coming back to let me know how much you loved it! From the reviews, I’m assuming the amount of spices indicated are enough to give the tenders that KFC flavor…My husband doesn’t like spicy & I do, so he would probably like that amount of spices in the recipe. Will let you know how they turn out. They will probably become a regular in my meal rotation. Looks delicious. Could you do this in the oven ? It really won’t be as crispy in the oven. You might be able to do just a light breadcrumb coating and try it in the oven that way. I made this for my boys Wednesday evening. They gobbled it all up lickity-split! Love it!! Definitely kid approved! Did they really crisp like the picture? I’m definitely making these for my picky grandchildren one night this week. They are always at my house on Thursday nights. I know they will go nuts for them. I’m also looking forward to them, they look SO good. These look super crispy! ! I have to make them! The crispier the better for me!! YUM! I absolutely love a chicken tender like this!! So crunchy! I love a good crunchy chicken tender and these sound perfect. Doesn’t get much better than super crispy chicken just like this! Lo Is so delicious! Wowza I can practically taste these through the screen!! They really need to come up with that technology!! i think my husband would marry me all over again if i made these for him! You can serve them at your vow renewal, haha! Can I make these in a air fryer?